"Mom, can you make sure they get my good side?" They showed off by singing the ABC's for both the doctor and the nurses, just in case any of them were concerned for their verbal skills. They also both took their shots like champions--I was proud. Jeremy was prouder when I told him their stats, convinced that they may be the first twins to both play on the Olympic Basketball Team. I'm working on Lilly's post and am delayed in posting some fun pics from a few family outings, so stay tuned. Last year I did separate posts for both of my girls, illustrating to everyone just how DIFFERENT they are. 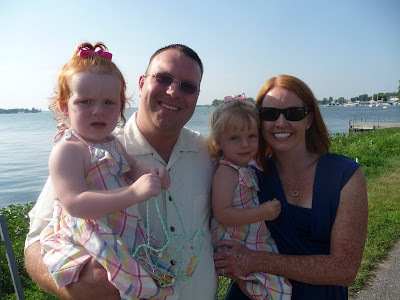 You can see the changes in this old post about Addy (click here). I wanted to do the same now that they are 2 and changing everyday. Addy has more energy than I ever thought possible, the girl never walks anywhere, she goes in a full-blown sprint. She has become so good at playing pretend, endlessly taking care of her babies or stuffed animals. She frequently brings them to the table when we are eating so they can eat too. She continues to love to play independently frequently turning her back on her sister, so Lilly can't see what she's playing with. However, this doesn't mean she isn't a GREAT cuddler, she'll run around like an absolute maniac, but pause for a second, run in for a hug, then she's off again. She is a great eater and will try just about anything you put on her plate, but her favorites include corn, hard boiled eggs, turkey dogs, mac & cheese and rice cakes. She is pretty good in new places and rarely cries when I leave her. I've observed a few different times, her walk right up to an adult, stand below them and say sheepishly, "hi", waiting for some kind of formal introduction. She plays hard all day long and struggles to get herself down at night, sometimes talking/yelling in her crib for an hour after bedtime. She still occasionally has 'night terrors' which are awful and cause her heart rate to jump and she's covered in sweat, but the doctor assures us this is typical and she'll more than likely grow out of it. She seems to be the more crafty of the 2 at this age, playing for longer periods with crayons, play-dough, etc. Addy is also NOTORIOUS for collecting/organizing things, which is hilarious if you know me. She will spend hours searching out ALL the animals in the house to put in one place or ALL the leaves from the backyard. Hopefully this is a sign of a very clean room during her teenage years! Here's a video of our dancing queen. Ignore the hair, we'd just had bathtime and she DID NOT want her hair brushed (did I mention she was VERY opinionated?). Mike & Heather are dear family friends to the Ash's and everyone involved in this wedding 'go way back'. 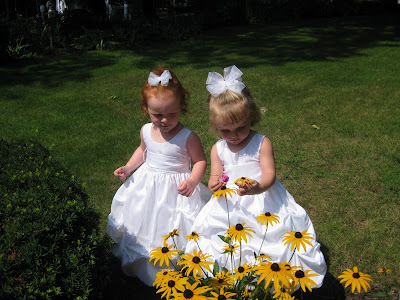 So when the couple called us last year to ask if our girls would be flower girls, we were more than thrilled. A lake wedding surrounded by all the people and things Addy & Lilly love? We were excited from the start. 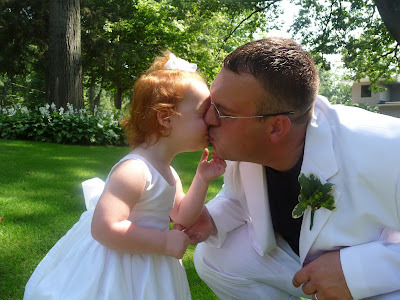 I have to admit I got VERY nervous a couple months ago, realizing that at BARELY 2 years-old, we wouldn't have good listeners on our hands and the wedding was bigger than I thought (500 people), so I thought we might suffer from a bit of 'stage fright'. So, how did we prepare? (Especially important if you are embarking on this flower girl journey with little ones anytime soon.) We talked about princesses....a lot. I try and be pretty gender neutral for the girls, loving it when they choose trucks over dolls and we recently bought a big train set that they adore, but in this case, it was all about the princesses. Heather (the bride) was the queen and they were her princesses, we practiced twirling and wearing the dresses around the house. It was a total riot. But the day came, the dresses went on, and I swear they believed it. They were so well behaved, I was astounded. Secondly, we planted gummies...a lot. Everyone had some gummies---the groomsmen (who included Addy & Lilly's daddy & 2 uncles), the grandmas (strategically placed at the end of the aisle) and of course me! The girls were coached down the aisle and Addy took direction so well walking nicely with the junior bridesmaids, But Lilly, who lives by the motto "in my own time," walked herself down the aisle long before the wedding coordinator gave her the cue--(sorry, but I think the coordinator realized you don't cue a 2 year old, they cue you!). The day certainly wasn't about us and we were so grateful to be a part of such a special occasion, but seriously, could they be any cuter? Lilly loving on her daddy! As the summer quickly got away from us, we decided we needed to hit the brakes, slow 'er down a bit and head north. 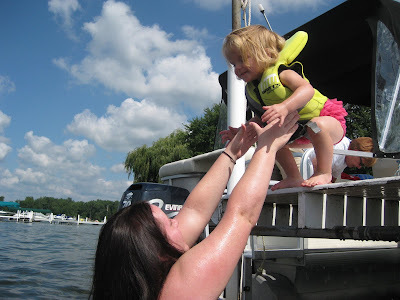 Lake Tippecanoe in Northern Indiana was our chosen spot--the place where Grandma & Grandpa Ash have a lakehouse and Addy & Lilly would be making their flower girl debut (more on that in an upcoming post). A mere 2 hours away, but just enough 'vacation' for us. The weather was PERFECT and we brought in a few friends! Grandma & Grandpa Sadler rented a place so we got to see them, Aunt Cat came from DC, Uncle Jon from Indy and a wonderful family friend, Joyce Tiley, from Atlanta. The entire Ash family was on hand for the wedding, so, we had both sides of the family merge together for some fun. My pictures are endless and will be coming to me through a few different sources, so I'll probably dedicate a few posts to this trip. To start off, some tips on things you MUST do if you are headed to Tippecanoe/Wawasee lakes anytime soon. 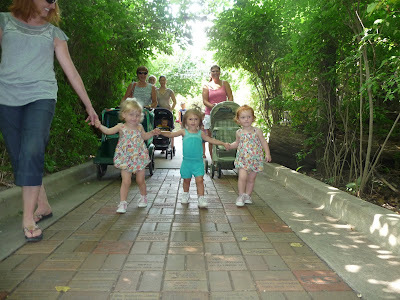 Invite a friend and head to the Fort Wayne Zoo. Spend a bit of time everyday on the water. 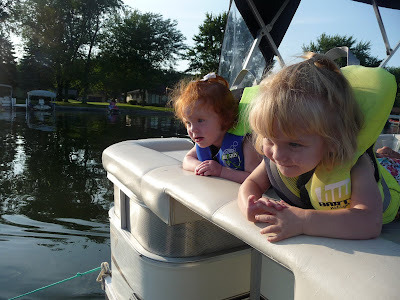 The girls have no fear of the water at all and LOVE hanging on the boat. "Boatride" was usually the first words out of their mouth in the morning! Stop in at Maria's House of Pancakes for breakfast. Entirely too much food for anyone to eat, but a good spot nonetheless. Both times the girls went, they ate more than I had ever seen them eat. 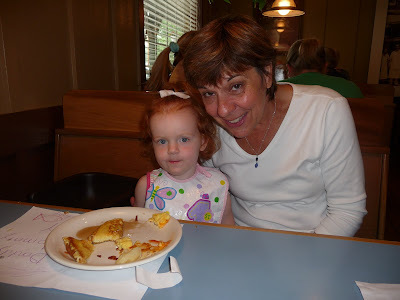 Lilly amazed us when she said to the waitress "More bacon, lady." --Seriously, Lilly? 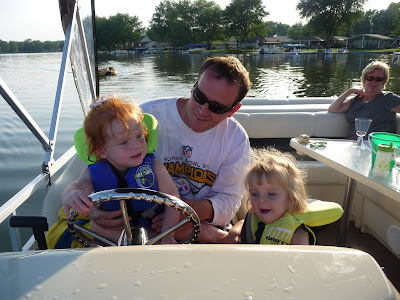 Uncle Jon seemed to be the most patient with the girls and driving the boat, letting them honk the horn, play with the radio and sit on his lap. Jump off the pier, again, and again, and again. This trick didn't seem to get old for Addy or for Aunt Cat. No, we never went above an idle, but doesn't Lilly look like a pro? Addy loved this with Dad, scared at first, but then kept saying "again", "again", "again". All-in-all, a great trip/vacation/time spent with family! Can't wait to share pictures from the wedding, if you have any, send my way! I was too preoccupied to take many with my camera! Thanks to all who made the week one to remember! I tried all day yesterday to post this, but couldn't until I was back with high-speed internet today. 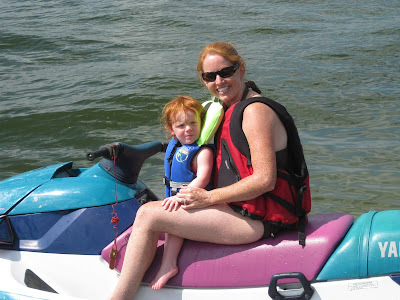 We are having so much fun up at the lake and the girls had a hell of a birthday! I'll post more pictures and stories later, but couldn't resist trying to get this up. Addy & Lilly turn 2 next week and I'll spare you all the "I can't believe it's been 2 years since they've been in my belly" talk and get on with the good stuff! 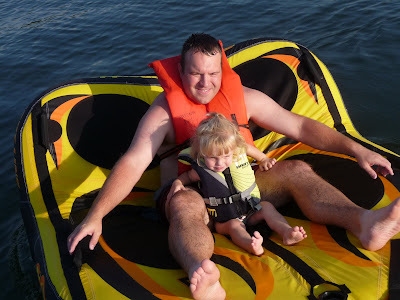 We moved the party up because they will be making their flower girl debut next week and Daddy's birthday is this week, so we'll be spending 10 days starting Thursday at the Lake! So, 9 days early it was. We decided to do a party in the park because they both LOVE being outside and honestly, I wasn't sure I was up for 14 kids wrecking havoc in my house. The park worked out great with only a few bumps in the plans. Weather was BEAUTIFUL and we were surrounded by all our family and friends who LOVE our kiddos! Who can ask for more? Cast & Crew of the Cupcake Party (top to bottom, left to right): Max L., Jack W., Jacob D., Jaxson J., Audrey S., Chase E., Mallory C., Cooper E., Tyson J., Ben S., Dakota J. & Evan S.
I had to include a rare picture of my girlfriends and our munchkins! Love you girls!